Derry Aust wrote us: My father Reginald was born in Box in 1898, the only one of seven children to do so as all the others were born in Colerne. For some reason, my father was sent to live in Kidlington, Oxfordshire, when he was 10 years old, where he had two older sisters, Amelia and Edith. The rest of the family, including my grandfather Thomas and grandmother Emily lived at Mead House, Box, which I have visited and appears to be made into two dwellings now. Hope this may be of interest. I would be grateful for any further information. We have looked for more information about the Aust family and came across some amazing details of Box people under that name. 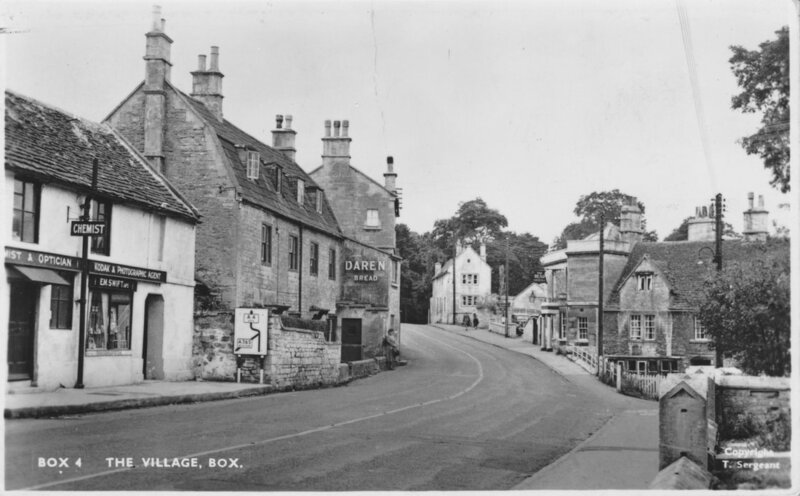 The Aust family had a long connection with Colerne and Box. It is difficult to trace them back beyond a couple of generations but their name crops up frequently. The Austs were a prolific family in Colerne. In Moon Close, Bath Lane, in 1861 lived seven separate Aust households: Sarah, farm widow with four children; Peter Aust, agricultural labourer; William, Derry's great grandfather, see below; Sarah, widow; Elizabeth, widow with one child; George, journeyman maltster with wife and two children; and Richard, baker with wife and one child. Four of the properties were still occupied by the family a decade later but many of the heads of the household had died and most of the children had moved away. But the similarity of Christian names and the of professions (many of the men were carpenters or journeyman maltsters) is indicative of the closeness of the family. At this point, we need to leave the Colerne family and trace an incident involving George Aust, who had been born in Corsham in 1811 and moved to Box Hill to work as a carpenter in about 1847. The connection with the Colerne family is uncertain, but the profession and similarity of names is again apparent. In 1858 George was involved in the scandal of the decade involving the Rev Dr Horlock, vicar of Box. The unexplained deaths of Horlock's wife and sister-in-law, of the fabulously wealthy Sudell family, during the Christmas period of 1857 had caused a great deal of village gossip. We need to start the story four years earlier when Rev Horlock had been threatened by Henry, the son of Dr Sprague. Horlock had at first promoted Dr Sprague in Box but later favoured another doctor, Dr Nash of Kingsdown. Henry wrote numerous anonymous letters vilifying Rev Horlock, threatening to kill him and his daughter, offering £100 to two of their servants to kill them with arsenic and using Benjamin Bullock, sexton of Box, as an accomplice. The death of the sisters seemed to be the fulfilment of the plot but, if all this wasn't enough, George Aust was called as a witness to the inquest in January 1858. A month before the deaths, George Aust, carpenter of Box Hill, received a letter signed H Barrington offering him the chance of a third share of Sudell property in Lancashire worth £50,000 if he would secrete some gunpowder in sacks near (Ashley) House and get in by night over the hedge toward the green and set house on fire in different parts and ... soon blow the house to pieces. The letter implies that George had been implicated in a robbery at The Hermitage, Box when he talks about Reverend Horlock's sister-in-law, who had been the enemies to you and your family since the robbery at the Hermitage. The letter was clearly written in a deranged state of mind and we don't know whether any of the allegations against George were true. For his part, he continued to lived at Box Hill and Quarry Hill from 1847 until 1892. Meanwhile, back to the story of Derry's direct ancestors. Derry's great grandparents were William and Anne Maria both of whom were born in Colerne. William was a journeyman maltster (a brewer qualified by apprenticeship but working as an assistant) and Anne was a seamstress. They lived at Moon Close, Bath Road, Colerne for several decades and had five children, including their fourth child, Thomas. Thomas eventually followed his elder brother, Edwin, into a career as a carpenter but, to get work, he had to leave Colerne and moved to Box. When Thomas died in 1935, aged 78, his obituary recorded that he was living at 4 Market Place, Box. He was a carpenter by trade and had worked for the Northey Estate for a number of years before becoming self-employed after the Estate was sold. The newspaper reported that Thomas had been married three times, probably Emily Watson in 1880, Sara A Holder in 1918 and Emily Bence in 1923. He left a widow and three sons and three daughters. He was reputed to be a very hard worker and often assisted with the organ at the Methodist Chapel, Box Hill. The report said He loved his garden and spent his leisure time in it. A year earlier Thomas had made a remarkable discovery in his garden in Box reported as a queer animal, rather like a baby tortoise, with large and bulging eyes and an abnormally long tongue. The newspaper reporter came to the conclusion that the animal was a chameleon imported into the country as a pet. Reginald served in the RAF in the First World War, working as an Air Mechanic Second Class in 226 Squadron. He was engaged at the Battle of Otranto in 1917, attached to the Royal Navy, in a massive battle against the naval forces of the Austro-Hungarian navy, who were raiding the Otranto Barrage. In 1920 Reginald was part of the Bath Scouts Jamboree at Sydney Gardens and came away with a telescope as first prize in the handicrafts exhibition for his working model of a roundabout. With his marriage to an Oxfordshire girl in 1929, Reginald's connection with Box was broken; hence the reason for Derry's email. Charlotte E (b 1836 Corsham); Amelia J (b 1838 Corsham); Edward (b 1840 Corsham); Sarah Ann (b 1842 Corsham); Clara M (b 1844 Bristol); Harriett E (b 1847 Box); James M (b 1850 Box). James (b 1859), agricultural labourer. Reginald William (b 1898 in Box). Reginald Derry Aust (b 1935 at Ploughley, Oxfordshire).